We represent the 4000 or so residents of most of the parish of Slateford/Longstone, which includes, not just Longstone, but Redhall, Slateford, Kingsknowe and the area around Dovecot Park south of Lanark Road to the river (see plan on the ABOUT US page). This page will show the latest news and activities. For older news go to our NEWS page. LCC does not meet in January, April, July or August unless there is urgent business. If you are concerned about the security of your home, note that Police Community officers can provide home and business crime prevention surveys free of charge. Call 01786 289070. 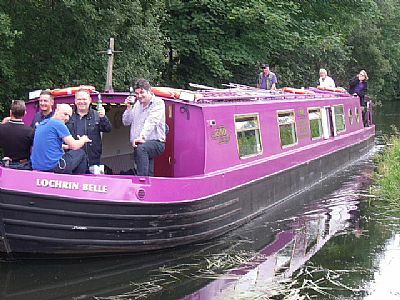 ReUnion barge on Union Canal by Kingsknowe Road Bridge. A report on LCC's Remembrance Ceremony on 11 Nov 2018 is on our NEWS page. See NEWS for result of 2016 election for LCC. For meetings and events see the DIARY page. Do you want to arrange a street closure for a children’s play event in your street? Playing Out is a pilot scheme that runs from July to October 2016 that lets you close your street for free. If you can't get to a City library, make use of this free bus service run by the RVS. You can choose your books and enjoy a coffee and a chat before being taken home again. Or use the Home delivery service or the Mobile library service, which visits care homes, retirement flats and sheltered housing complexes. For the Water of Leith Conservation Trust go to their website: http://www.waterofleith.org.uk/. Residents should note that a local forum called Nextdoor (https://nextdoor.com) allows them to keep in touch with neighbours and local events and problems. The LCC Secretary is a member of the Nextdoor 'Kingsknowe' group.